Speaker buggered? Is it not making any sound? Making a funny noise? Speaker problems can be a variety of issues, and repair and maintenance is usually the audio engineer’s responsibility. Check it out! First check obvious problems, like wires not being plugged in properly. If you have a working Left but no right, try switching the left and right wires to see if that solves the issue. Use a multimeter to check the ohms between the positive and negative leads to the speaker. Something between 1 and 16 ohms should be be the resistance of a working speaker. If its 0 or infinity there are likely problems and the speaker may be blown. Take the grill off, or figure out how to expose the speaker cone. Look for obvious problems like cracked or loose parts. Gently without power applied, push the speaker in with your hand (Gently!) IF you hear a crunching noise or if there are loose pieces of dust cap or rubber surround, you may be lucky and you can glue it with something like epoxy or super glue. Otherwise, you need to order a new replacement speaker or speaker refurbish with a new cone and voice coil kit. 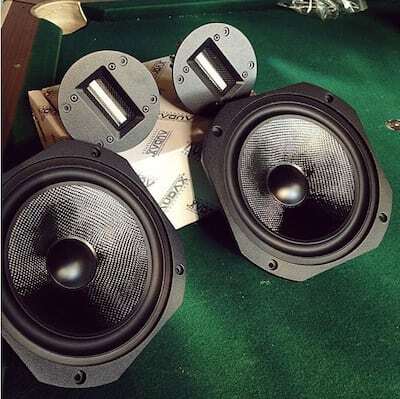 A right of passage for audio engineer or Live Sound Engineer: The voice coil, and speaker cone as well as rubber surround can sometimes be ordered from the manufactures to refurbish a blown speaker. The voice coil is the vertical tube that slides into the permanent magnet at the rear of the speaker. You can tear out the old speaker cone and voice coil on an old speaker to see how it works, but a rubber or soft outer ring holds the speaker cone, and the voice coil, covered by the dust cap slides into a circular hole. Relove all all traces of the old speaker cone. Use a razor blade or scraper tool to peel off all the outer surround or gasket, as well as the cone, and voice coil. Underneath the speaker cone is a crinkled piece sometimes called a spider. remove that as well. Clean out the air gap in the magnet, and all rememenants of voice coil must be cleared from the gap. A little piece of wire and compressed air, or some sticky masking tape can be used to get all the little pieces. If you have a really fried voice coil, it may melt and charr up the area. All pieces of the cone and surrounding rubber must be clean and ready for remanufacturing with the recone kit obtained from the manufacturer. Masking off the voice coil gap, and really cleaning the outer area with a grinder, or pre assembling the voice coil and driver may be required depending on the type of speaker. Assemble the voice coil and speaker cone, as well as the dust cap and spider and apply adhesive, reattaching the new speaker to the outer metal frame. Reattach the leads to the positive and negative terminal of the speaker. You may want to refer to the manufacturer’s guidelines. Let the speaker is dry for at least overnight, and then test the speaker voice coil clearance by pushing the cone in and out with your hand. If there is scraping or something rubbing, you need to start over and tear it out again and check the gap for foreign material. Hopefully, your speaker recone goes well, and it travels smoothly in and out and lasts for a long time! Keep those limiters in place, and don;t too much level go to the amplifier. Speakers have a finite life, although there are a lot of speakers that are doing well 20 or 30 years later, but protecting your equipment is important to sounding good. Speakers eventually wear out. The rubber surround gets oxidized and cracks, voice coils come loose, or get fried when too much voltage goes into the speaker. Super hot signal can go into the amplifier and clip the inpoutm producing a square wave that shoots pure voltage to the speaker frying the voice coil. Old speakers just wear out. The spider and other parts loose elasticity and stop returning the speaker as fast to the resting position. As the speaker ages, it loses it crispness. Oftentimes, a new speaker fresh from the factory or freshly remanufactured with a recone kit, will be very harsh and crispy, then mellow out as the glue and elasticity loosens up.